Be inspired by the history of our Guiding! Did you know that Girl Guides began in 1909 when a group of girls turned up to the Boy Scout rally at Crystal Palace and asked to join in. Their request for “something for the girls” led to Robert Baden-Powell and his sister Agnes founding Girl Guiding, which has now become a global movement, the Worldwide Association of Girl Guides and Girl Scouts with 10 million members in 150 countries. Take action and make a difference! 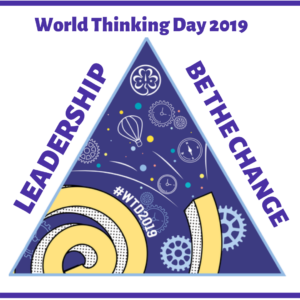 This year’s theme for World Thinking Day is Leadership. “It’s Time To Lead”. We are celebrating the early champions of a girl-led movement, the first leaders, and all those since our founding who have explored ways to be a leader in our organisation. Give back and help the worldwide sisterhood of Guiding! Since 1932, when Olave Baden-Powell, asked all members to”spare a penny”, World Thinking Day has been an opportunity to fundraise to support your fellow Girl Guides and Girl Scouts. Your donations help fund WAGGGS activities and are used where the need is greatest. More information can be found HERE and on the WAGGGS website.